Medics and security members work at the entrance of the Ataturk Airport after explosions in Istanbul, Tuesday, June 28, 2016. Russian President Vladimir Putin has said words of compassion for the victims of a series of bomb attacks at the Istanbul airport. "We are sorry, and we sympathize with the victims of the terrorist attack that happened yesterday," Putin said on June 29 in talking with Russian and German schoolchildren attending the first meeting in commemoration of WWII events. Putin said the projects similar to those in which the pupils participate "create such a climate that does not allow such awful things happen" like the terrorist attack in Turkey. 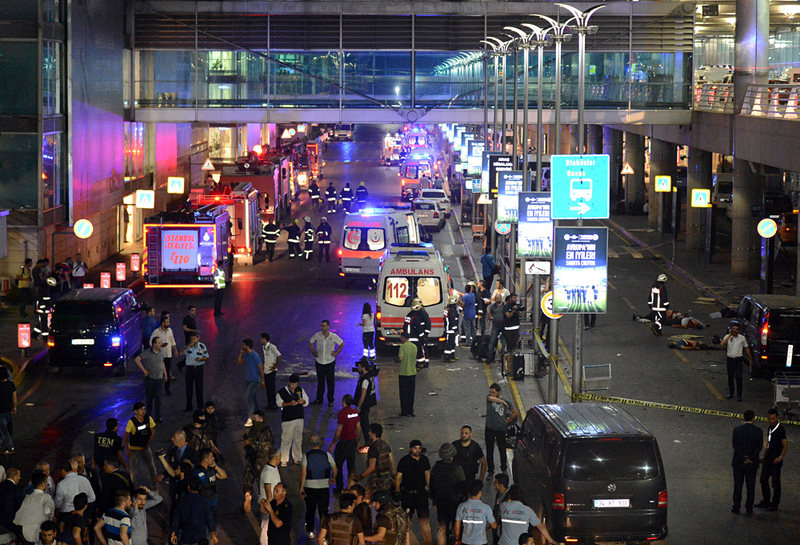 Suicide bombers blew themselves up late on June 29 at the international terminal of Istanbul’s Ataturk airport, killing at least 36 people and wounding 147 others. Unofficial reports say the death toll has reached 50. Turkey’s Prime Minister Binali Yildirim who visited the blasts scene said the terrorist attack could have been carried out by the members of the Islamic State group.